Just over half of families have a low payment-to-income ratio or less than 10%. Included are those who have mortgage free real estates and those who do not own a real estate. About 60% of families who have a payment-to-income ratio less than 10% do not own a real estate. The number of families with a low payment-to-income ratio increased in the given time-period. A little less than 7% of families had a payment-to-income ratio over 60% in 2015, their numbers decreasing proportionally from 2015 to 2018. Payment to disposable income ratio is one measure of the financial status of families and indicates how well the family is prepared to repay their loans. It must be noted that only payments of debts are included and therefore it is not possible to generalize the financial status of families from these findings. For example a family on the lease market can have low debts and therefore a low payment-to income ratio resulting from debts but their income might not cover lease and other cost of living. The results published here are part of a statistical project on household debts entrusted to Statistics Iceland by the authorities. 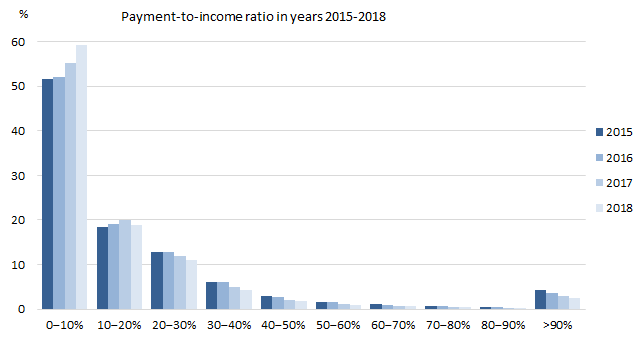 Detailed statistics on the debt-to-income ratio and payment-to income ratio in 2015-2018 by age, type of family, disposable income deciles, assets and net wealth can be found on the Statistics Iceland web. In addition, the main results and methods are outlined in the Statistical Series. Results for 2018 are preliminary results.